Dr Nadebaum gave evidence on contaminated land and groundwater, focusing on three sites: the former gasworks site in Fitzroy, Royal Park and Melbourne cemetery. His evidence resulted in more questions than answers: where might contaminated spoil be deposited? Is the risk from airborne contaminated soil, unearthed in the tunnelling process, adequately covered by the specified performance requirements? What length of ‘cut and cover’ is accounted for in his calculation of spoil-volume? Will soil be stockpiled on Ross Straw Field? If Debneys’ Park playground is to be relocated, will a contamination assessment of the former tannery land need to be undertaken? Vibration consultant Dr Heilig said perceptible levels of vibration would be produced for properties above the tunnel. Affected residents would be able to request relocation for the duration of boring beneath their homes (probably only a few days). The vibration levels set are more about the impact on human comfort, rather than damage to buildings – the possibility of which is remote in the tunnelling operations. The presence of Shot Tower would limit the scale of blasting which could be undertaken in its vicinity, but the same precautions were not mentioned for blasting around the zoo. Tim Anderson’s evidence on groundwater was delivered late in the day. In summary, there is poor quality ground water in the region, but it will be up to the contractors to select tunnelling methods that best manage the ground water. 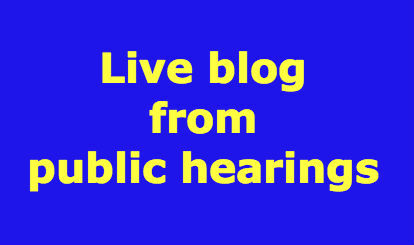 Tomorrow John Patrick and Heather Nesbit will give evidence on cultural landscape and social impacts. Peter Fearnside continued giving his evidence and was vigorously cross-examined. Questions fired by Chris Wren elicited answers such as “people are happier to hear Thomas the Tank engine than cars”. – NSW limits are 58dB. Victoria is 63dB for new roads and 68dB for retrofitting barriers on existing roads – 10dB above NSW; the CityLink concession deed keeps the limit at 63dB. Lucky us! – He hasn’t modelled the impacts of the Part B viaduct through Arden-Macaulay precinct where land oweners are being encouraged to redevelop land. Tensions rose when Fearnside was questioned by Moonee Valley City Council. Louise Hicks brought the panel’s attention to the differences between a map in the CIS showing which roads would experience increases in traffic, and the map put forward by Fearnside. “It’s not the same, is it?” said Hicks. “I can’t tell you why they are different,” replied Fearnside. Fearnside’s evidence, based on the same GHD data relied on in the CIS, wrongly left off the 30% increases in traffic volumes in Mooltan St and Ormond Rd. Subsequently, his recommendations do not reflect these changes in traffic volumes. Fearnside was the project manager for the noise section of the CIS, making the discrepancies between his statement and the CIS all the more surprising. He also confirmed that no results show cumulative noise results for EWL and CityLink – especially relevant for the Flemington housing estate and the ALT tower. And that “modelling is inherently conservative”: “when you have a real situation, you measure”. Yarra quizzed Fearnside on why, after 15 yrs of expertise in NSW ‘sleep criteria’, Fearnside never raised the issue for consideration when advising the LMA. City of Melbourne pointed to the evidence that the noise outside the zoo will be at 70dB (the Elliot Ave portal), and at this level, people would find it difficult to have a conversation at a distance of five meters. With the noise level around the portals at 65-70 dB, some people will not choose to stay, he said. 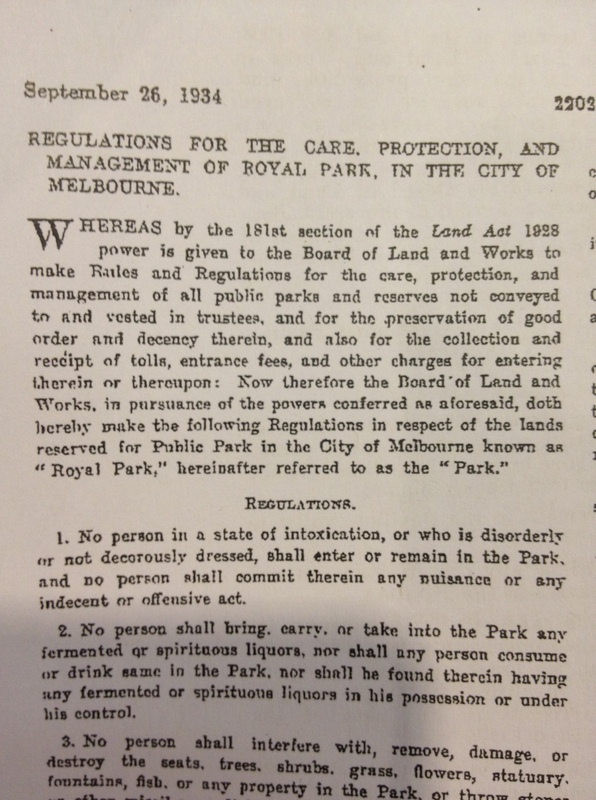 A 1934 Regulation prohibiting removing and damaging trees in Royal Park is still in force in Victoria. Counsel for the City of Melbourne tabled the Regulations this morning. The Regulation bans people from interfering with, removing, damaging or destroying trees, shrubs, grass and flowers in Royal Park. It was gazetted in September 1934 and, with other Regulations, sits under the Crown Land (Reserves) Act 1978. It is not a planning control, but it is a prohibition. Now we hear from Peter Fearnside on noise. On the matter of construction noise, construction activity is to take place between 7am and 7pm Monday to Friday, and 7am to 1pm on Saturdays. During night times – 6pm to 10pm – noise levels should not exceed background levels by more than 10dbl for more than 18 months. The contractor will need to provide detailed management plan, an important part of which will be community consultation and how complaints are managed. Fearnside says there may be necessary to do more testing inside apartments adjacent to the freeway in order to meet the limit of 63dB. On that, NSW limits are 5dB less than Victorian levels. This can be discovered in the 66 pages of the NSW Noise policy and the 2 pages of the Victorian policy. VicRoads does not protect recreational land, so no mitigation measures will be taken. Fearnside says the noise limit of 63dB can be achieved for Ascot Vale, Moonee Ponds and Travancore – Ormond Park is already affected. More after the morning tea break….